Al Barrack now knows the dangers of doing business in Barbados where the law and the courts are ignored by government. Over three years ago businessman Al Barrack won at 34 million dollar judgement against the National Housing Corporation. Of course he wasn’t paid, and the amount owed to him including interest is now over 62 million dollars. The NHC is ignoring Barrack. So is the government. The real message that the silence delivers is that the NHC and the government know they can still out-lawyer, out-spend and out-wait Al Barrack until he has a breakdown, heart attack, up and dies or does something foolish because any man would be half crazy by now. Not that Al Barrack is half crazy. He’s not yet gone ’round the bend and the NHC and the government don’t understand that because they have been trying their best. The case has been going on since 2002. He won in 2006, but it didn’t matter because both the NHC and the government have made it clear that it will be a cold day in hell before Barbados and the NHC obey the order of the court and pay what is owed to Al Barrack. That is just how things are done ’bout hey by the elites who control the government and the courts. Separation of powers in Barbados? Rule of Law? Ya mek sport, my son! Al Barrack was unlucky enough to have to sue a Barbados government corporation, and it doesn’t matter that he won in the courts – because around here the courts and the law are only obeyed by the ruling class when it is convenient for them to do so. Good luck, Mr. Barrack. We hope we will be proven wrong and that the government and the NHC will cut you a cheque tomorrow. But we’re not betting on it. CONTRACTOR AL BARRACK has declared himself owner of the National Housing Corporation (NHC). 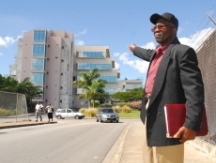 “I own the NHC,” he said angrily yesterday at a Press conference a stone’s throw away from the Government office complex in Warrens, St Michael, the source of a bitter dispute over payment. Barrack, who won a $34.4 million plus interest judgement against the NHC in 2006, pledged to take over the NHC’s assets to recover the debt which has now accrued to $62 321 268. “I am going to take their things. That building over there [pointing to the nearby Warrens office complex which sparked the dispute between him and the NHC], and everything NHC has. Sometimes the world is very large, and sometimes it’s very small. Today, it’s tiny because we’ve been getting a gazillion hits (well, ok, approaching a hundred so far) from Africa. Easy… Global Voices featured one of our articles in its Swahili edition. That’s kind of special, don’t you think? Now if we could only get translated into Italian. I’ve always wanted to see the Sistine Chapel. Wait… Oh… Well wat da ya know! Yup, the world gets smaller every day.